And that candidate is? Why Christine O’Donnell (R-You’re Joking), of course. What’s especially impressive is that it gets WORSE after she assures us she’s not a rhymes with b … i …. FWIW, I believe her. I can’t believe there’s a coven that would take her. Would the last African-American to leave the GOP please turn out the lights? 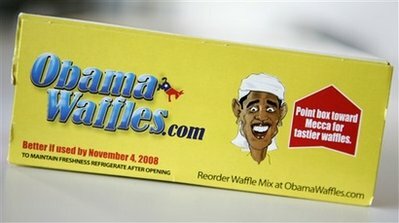 Activists at a conservative political forum snapped up boxes of waffle mix depicting Democratic presidential candidate Barack Obama as a racial stereotype on its front and wearing Arab-like headdress on its top flap. Values Voter Summit organizers cut off sales of Obama Waffles boxes on Saturday, saying they had not realized the boxes displayed “offensive material.” The summit and the exhibit hall where the boxes were sold had been open since Thursday afternoon. I actually like the idea of Obama Waffles as a satirical product (indeed, I quite like the image of John Kerry endorsing the waffles on the group’s web site). Had the group used a picture of the senator or at least a caricature that looked like him I would have said, “Good on you.” Using a drawing that makes him look like the child of Uncle Ben and Aunt Jemima was just stupid. Y’know, there are a number of African-American conservatives out there, might be a good idea to recruit a couple. In this case the foriegn language seems to be courtesy. So much for Republican minority outreach efforts. [Georgia Republican Rep. Lynn] Westmoreland was discussing vice presidential nominee Sarah Palin’s speech with reporters outside the House chamber and was asked to compare her with Michelle Obama.”Just from what little I’ve seen of her and Mr. Obama, Sen. Obama, they’re a member of an elitist-class individual that thinks that they’re uppity,” Westmoreland said. Well, he must have figured they weren’t going to get any of the African-American vote anyway so let’s insult women, too. The senator’s pick of Alaska Gov. Sarah Palin is brilliant. Far better than either of the two people I suggested yesterday. Now if he can just let her do the talking and get everyone else in the campaign to shut up. Ooooh, it’s going fo be a fun 67 days. And by fun I mean really really ugly. The political conventions are perfectly timed this year, serving as a perfect antidote to the just finished Munich Beijing Potemkin Olympics. Whatever their many moral faults, the Olympics weren’t boring. This year I became entranced with field hockey. That was fun to watch. Not as much fun as Usian Bolt, but nothing is as much fun as watching Bolt. The fun couldn’t even be spoiled by the commentator kvelling about how if Bolt had just really focused when he won the first two gold medals he really could have done something. A) He won the damn races going away, so shut up. B) He showed plain old fashioned joy while doing it, so shut up. The only thing that could have made these games better would have been if NBC had dedicated one channel to a constant live feed of the complete lack of activity in the officially sanctioned protest sites. Oh wait. One other thing could have made this better… any sign of moral cojones on the part of the athletes. Dudes & Dudettes this is the 40th anniversary of Tommie Smith & John Carlos simply raising their fists in salute during the Mexico City games. Yeah, they had to put up with a feces storm the likes of which I can’t imagine. But they never had to wonder about their own integrity. I wish one medal winner had had the courage to receive his or her award with a piece of tape over his or her mouth. That’s all it would have taken. It’s not like you were being asked to stand unnarmed in front of a tank. My self-righteousness is unjustifiable. I participated too. I watched the damn things. I wasn’t even willing to sacrifice changing the channel, who the hell am I to ask others to do anything? Now our dusk to dawn interlude of strange and interesting sports and moral peregrinations is about to give away to O’Biden vs. McCan’t. At a time when the press is bleeding money it is impossible for me to understand the amount of money that is spent covering two events with practically no news value whatsoever. I have been told there will be some 4,000 15,000 (thanks Tim!) members of the media covering each convention. 4K people spend a week hoping one person — any person — makes a mistake by straying from the script. And just a note to the O’Biden team — WHO THE HELL DOES A MAJOR NEWS RELEASE ON A SATURDAY IN AUGUST? Any bump from the announcement is dead by the time Monday rolls around and people start paying attention again. It almost looks like you didn’t want the pick of The Human Wind Tunnell to get much play. Suffice to say, we will all be well and fully informed watching whatever snippets The Daily Show and Colbert Report decide to run.